This essay is a reflection on the practice of inner silence in everyday life. Daniel A. Seeger became a conscientious objector to military service during the Korean War after reading Gandhi in a required “Contemporary Civilization” course in college. He first encountered Friends after graduation, when the government sought to draft him, and an acquaintance suggested that Quakers might be able to help him. After consulting the telephone directory, Daniel Seeger became a draft counseling client in the New York Office of the American Friends Service Committee (AFSC), where he later served as Regional Executive Secretary. The encounter between Daniel Seeger and the Selective Service System resulted in the well-known court case of The United States of America versus Daniel A. Seeger. After strenuous efforts by the Central Committee for Conscientious Objectors and by attorney Kenneth Greenawalt, the United States Supreme Court unanimously decided the case in Daniel Seeger’s favor, thereby greatly broadening the basis for religious conscientious objection to military service. 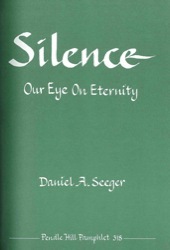 Daniel Seeger joined the Religious Society of Friends in 1967. His work on behalf of the AFSC in the broader peace and social change movement led to frequent encounters with those whose faith in nonviolence had eroded, and with members of the Christian community who, out of sympathy for the oppressed, tended to replace the Church’s traditional rationalization for “just war” with a theory of “just revolution.” The temptation to do this found expression even in the corporate activities and statements of Friends’ bodies and agencies. Dan Seeger sought to address this problem in the Pendle Hill pamphlet, The Seed and the Tree, which is one of many essays he has written on themes of importance to Friends. After working for the AFSC in New York, Daniel Seeger served as Executive Secretary of Pendle Hill in Wallingford, Pennsylvania, until his retirement in 2000. He has also been active in the Friends World Committee for Consultation, seeking to foster communication among the various branches and traditions of the Religious Society of Friends.